One of the guys you will definitely recognize across the sidelines against Michigan will be the offensive coordinator, Al Borges, former OC at Auburn. Borges resigned from Auburn December 10, 2007, after a steady decline in the team's offensive production, before the team's appearance in the New Year's Eve Chick-Fil-A Bowl. 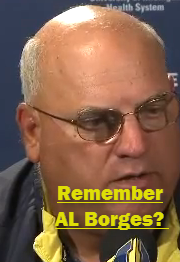 Borges leads the Michigan Wolverines offense into the Alabama game with an idea about what SEC football is all about. His offense is lead by the All-American QB Denard Robinson. Below is a video of him talking about the passion of Alabama football, and the upcoming challenge of his offense. See the video below.